Panasonic is sticking with business-to-business tablets for the foreseeable future, even though the company announced a size many consumers would eye at CES 2014. The 7-inch Toughpad FZ-M1 is a Windows 8.1 Pro ruggedized machine designed to tough out the elements, dunks and drops, and the wear and tear of time. 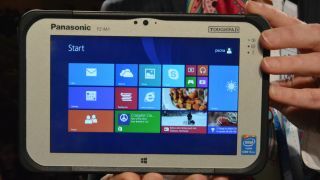 A consumer may fancy the new, fanless Toughpad, but Panasonic Device Product Manager Dan Diliberti told us that's not the the company's focus. "If there's a consumer who has those requirements, then it might be a fit for them," he told TechRadar following Panasonic's press event. "But that's not our target. We're a business-to-business focused company." It's a message the company has told us before, and one we're likely going to hear again and again, even as it introduces more form factors to its rough and tumble tablet line. The Toughpad FZ-M1 is thin for a machine designed to withstand 5-foot drops, but it's still got a girthy 0.7-inch frame. It's features are configurable, though the standard version packs a 4th generation Intel Core i5 vPro processor. Those with cost concerns can grab the tab with an Intel Bay Trail-M chip. Panasonic flushed it out to 2 pounds, and it's 7-inch screen measures a resolution of 1280 x 800. Storage sits at 128GB SSD and 8GB of RAM. The version equipped with the Intel Core i5 vPro will be available in early spring for $2,099 (about £1,279, AU$2,341). The company also announced the US availability of its suped-up, rugged 20-inch UHD tablet, the Toughpad 4K MT-MA6. The high-res device, powered by Intel Core i7 vPro and Nvidia Quadro K1000M GPU, will hit the streets in spring for $6,999 (about £4,264, AU$7,807). It's standard brethren, which houses a Core i5-3437U vPro chip and Nvidia GeForce 745M GPU, will be on sale next month for $5,999 (about £3,655, AU$6,695). Samsung has some new tablets, too.